Following the teasers on the next interesting episode of Koffee with Karan this season, Akshay ‘Khiladi’ Kumar will be seen doing something unusual. He will be shooting the rapid fire questions at the celebrated host, Karan Johar, for a change this time. The much awaited show this weekend has more promising moments. The promotional teaser unveiled by Star shows Akshay shooting some very interesting questions such as, “Which celebrity wife would you want to be married to – Twinkle, Gauri or Shilpa” and “Who would you rather have as your enemy – me, SRK, or the entire Chopra family” to which Karan looked taken aback. Akshay is known for his amazing comedy timing and he seems to have pulled it off the right way on the popular talk show. 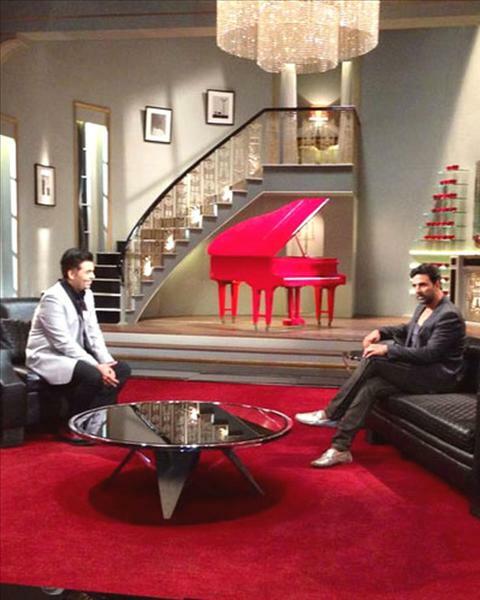 Karan Johar had over some new celebs this season, the likes of Aamir Khan also gracing his couch. The last epoisode showed Farhan Akhtar and Vidya Balan unwinding to their natural self with tons of humor. The new season is definitely heating things up, if not the coffee pot.